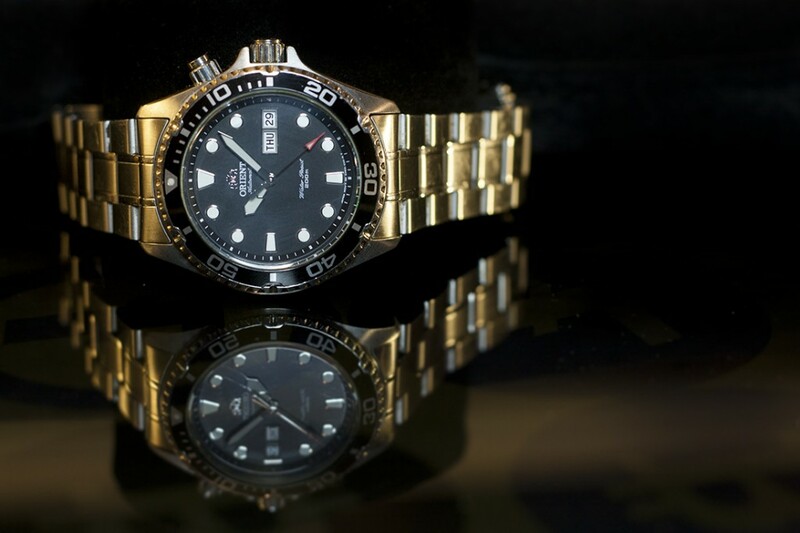 Orient is a Japanese manufacturer of dependable, mechanical watches. Designing and manufacturing their own movements for the last 50+ years, they have much deserved reputation of quality timepieces at an affordable price. 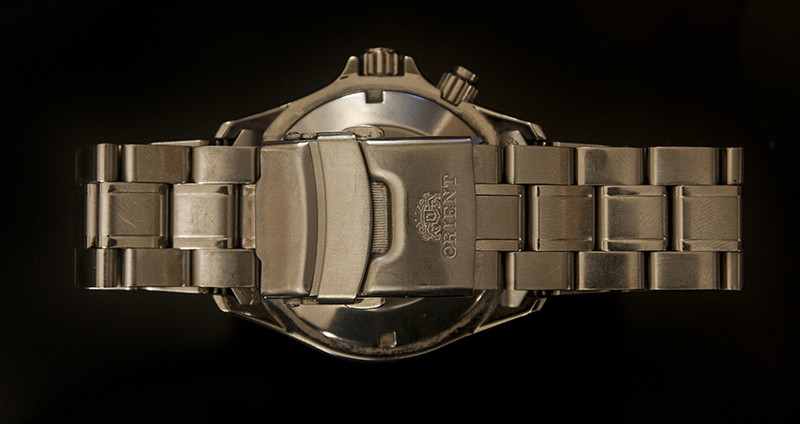 The Ray is the predecessor to Orient’s popular Mako line of watches. With the Ray Orient has added some new features and ironed out some of the kinks that plagued the Mako line, making it one of their best sellers. The Ray does a great job of fitting the mold of a capable tool watch while still keeping a low enough profile to work as a dressed up dive watch. The crystal stands slightly proud of the bezel with a gently beveled edge. The material is your standard mineral hardened glass. 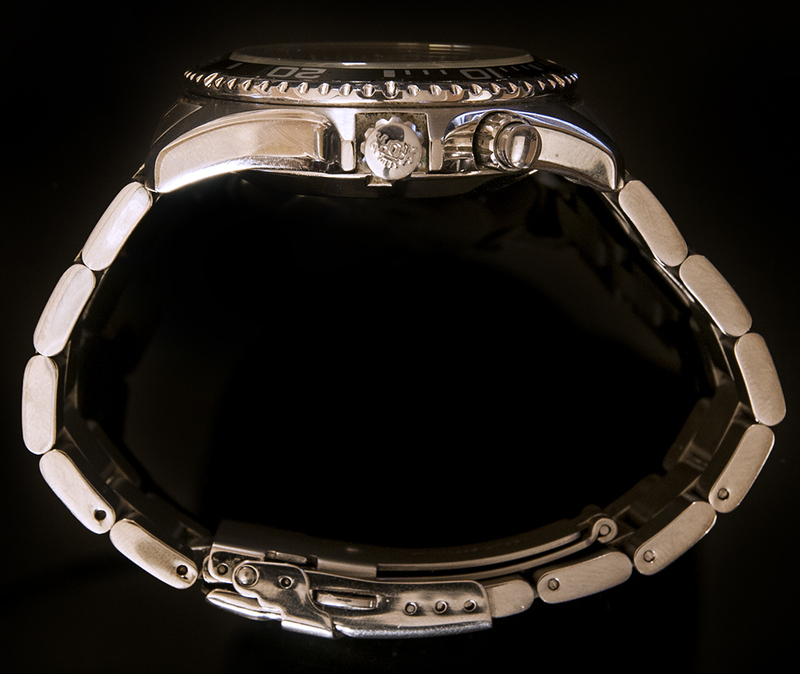 The unidirectional bezel feels tight and secure with a 60-click full rotation. There is zero back slipping and though I have seen complaints elsewhere, mine lines up perfectly at the 12 o’clock position. That said, the grip on the bezel is very shallow, which looks nice, but ultimately makes it hard to turn. The markings on the bezel are that of your standard diver with single minute markers until the 15-minute point, and 10 minute numerals thereafter. The dial has a matte finish that looks great with the over sized diver indices. 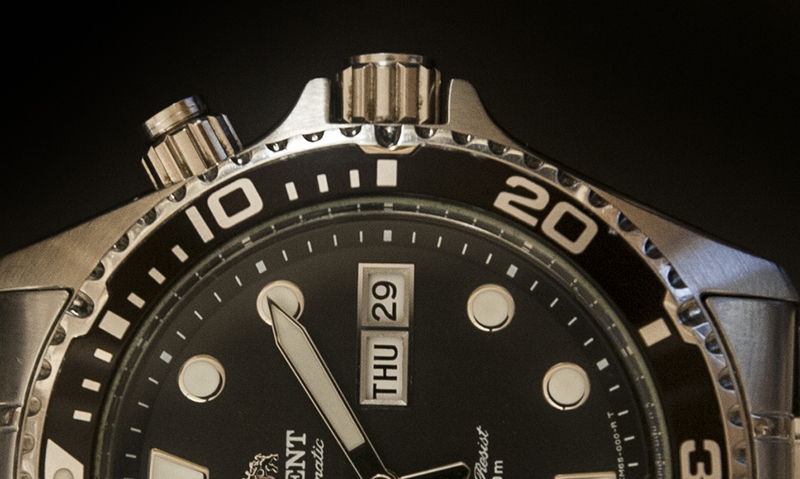 The scale of the hands to indices to bezel font is spot on to my eye, which is something that has bothered me on other dive watches. 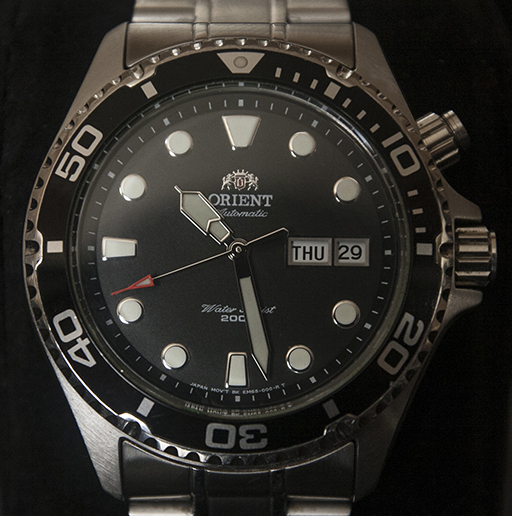 Orient got everything right for me in this design. The day/date window has a chamfered cut to it with an applied chrome border that matches that of the hands and indices. 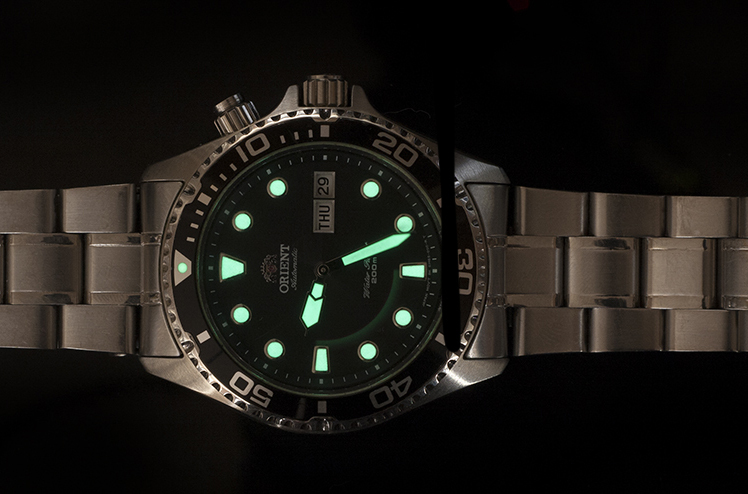 The lume on the Ray is just as bright as my Seiko divers, which is a great bar for Orient to meet. It glows like the sun and stays bright for quite a while. The silver border on the hands and indices makes for a nice sharp edge to the glow of the lume. Here is a comparison of the Ray and the SKX007. No complaints here. The Ray has a screw down crown as well as a screw down day quickset. I have heard people complaining that the screw down quickset can unscrew itself while being worn, but that hasn’t been my experience. It makes a tight seal on both the crown and the day pusher and while I haven’t personally dived with this watch I would feel fine taking it all the way down without any worries. The bracelet is one place Orient really improved with the Ray. The links are solid and the bracelet feels really great overall. 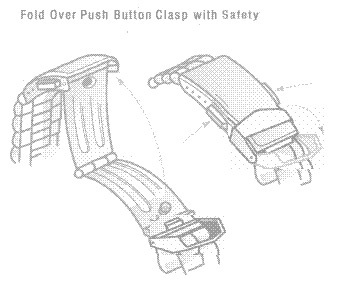 It uses a fold over clasp with double push-button safety. The oyster style looks good and the matte finish with polished stripes is a nice touch. The movement under the hood is Orient’s caliber 46943, which is a sturdy, reliable movement. The rotor feels smooth and is whisper quiet. The packaging is nice with a metal inset lid and pillow on the interior. Nothing too spectacular, but still perfectly acceptable. The Ray is an all around solid choice for anybody looking for a handsome diver under 300 dollars. The Ray (FEM6500) is available in Black, Blue, and Orange flavors. I hope you found this Orient Ray review helpful! Did I leave something out? Have something to add? Let me know in the comments. Good article, great pictures. For me the big win for the Blue Ray is the modification possibilities, i’ve just ordered the sapphire upgrade. Fantastic review! I found this review format really nice, with great pictures as well. I have just ordered this model and can’t wait to get my hands on it. One disappointing point for me as highlighted by the pictures in this review are the hollow end links on the bracelet. But at this price, it would be ridiculous to complain. I would still take a point off the bracelet score right off the bat though. Not a problem for the NATO strap enthusiast though! Isn’t the Mako the predecessor of the Ray ???? ?